If there’s one good reason to keep tuning into the Twins the rest of this season, it’s because we could very will be watching the end of Joe Mauer’s career. He provided a special moment for the home crowd Friday night. 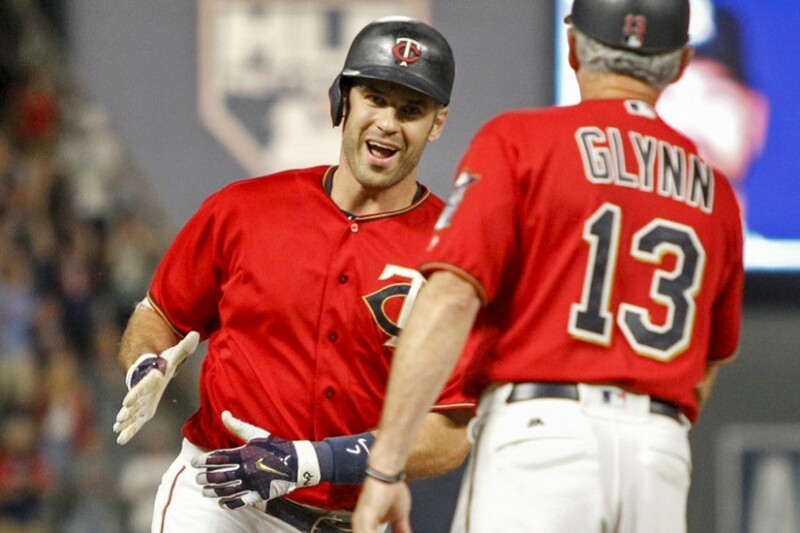 With the Twins trailing 3-2 in the bottom of the seventh inning, Joe Mauer came off the bench to blast a three-run homer that put the Twins up for good. This dramatic homer created a special moment at Target Field, as the Twins Territory faithful gave Mauer a curtain call. Will he be back next year? Even Joe himself isn’t thinking that far ahead. For all we know, this is going to be it. Soak it up while you still can. The Twins really flexed their muscles tonight, as all five of their runs came via the long ball. 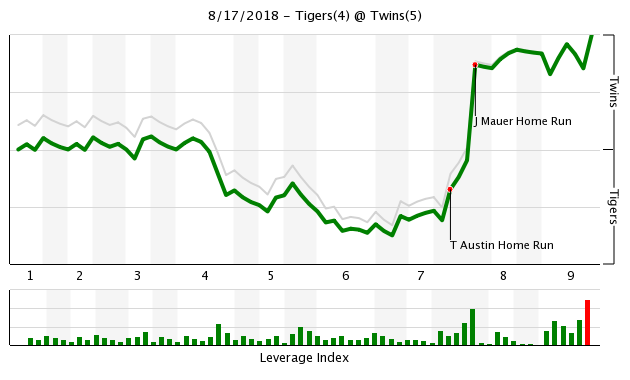 Eddie Rosario got the Twins on the board with a solo shot in the sixth before Tyler Austin hit an epic solo homer of his own in the seventh. Austin also broke up Matthew Boyd’s no-hit bid with a single in the fifth inning. Kyle Gibson induced four ground ball double plays in the first five innings of this game and ended up holding the Tigers to three runs over seven innings. Gabriel Moya pitched a perfect eighth before Matt Magill came in for his first save chance. Are we sure Fernando Rodney’s nickname was fair? I mean every save opportunity is an experience, isn’t it? Anyway, Magill gave up a leadoff double to Victor Martinez, retired the next two batters but then gave up an RBI single. Magill walked the next batter to end a 13-pitch battle. That was enough to knock out Magill. Taylor Rogers entered with runners on first and second, two outs and the Twins clinging to a two-run lead. He induced a grounder to Miguel Sano that gave the Twins the victory and Rogers his first save in the 181st game of his career. It seems like we go nuts whenever Joe hits a home run, they're so rare. That's not necessarily a knock against him, and he is great in clutch situations. I'd just like to see him hit one out of the yard more than once a month. I'd just like to see him hit one out of the yard more than once a month. yeah, and people in Hell want ice water. Ah the great debate with Joe. Big spot, great hit, clutch. But if it were not for some questionable calls, he would be on first base, more than willingly. Best in MLB with RISP this year. Kind of sums up Joe, always a great hitter with RISP...but very willing to talk a walk with RISP too. It worked out great tonight. Is Joe done? He could be. Who would blame him if he walked away after a great career. Part of me wishes he would for his own sake after so many great season's and his future with his family. The reality is he found a re-surgance in 2017. That seemed to carry over to this season before his "concussion like" symptoms. But in his last 30 games he is still hitting .291 with a .349OB. His last 7 games are even better. There is still real value there. Especially if there is enough power and RBI production elsewhere in the lineup. But it was, indeed, another great moment. I have looked at Austin's history. I've seen mediocre things and some really good things. I've seen a decent but not great OPS. I've seen good BA, good OB and good OPS in his milb career. Only 26, is this an opportunity and change of scenery guy who could really contribute the next few season's? Absolutely not going to bank on him. But there is opportunity. And consider me intrigued. One of my biggest pet peeves is the Mauer bashing. It wasn't his fault the Twins offered him the contract. 6 time All Star, 3 Gold Gloves, 1 MVP and 5 silver slugger awards. It is not all about homeruns. If you look at the stats, Mauer's are rather surprising. He is a pitchers nightmare in that scenario. So, why did we sign all those F.A. in the off season?I hope this shows the F.O. to trust the Farm System we have.I've got no problem bringing in guys to S.T. but we don't need to Sign So-So F.A. One of the funner games this season. Vulture wins are sweet. Well, to me it's not really surprising.And It's not just the BA. The OBP is over .500 and the slg % is over .600. Thing is, he only has 78 PA with RISP this year. BTW, which AL 1B has a higher BA w/RISP? The HR was nice...notable for its rarity. Any analysis of the BP usage tonight? I.e was Magill getting a special look see? Rogers was brought in facing a switch hitter, correct? Looking at Tom's excellent spreadsheet, it seems that Hildenberger was just as rested on this night. I guess developmentally, I'm impressed with the last two days of managing the BP. I was one that lamented letting Erv comeback out and get into trouble, but I think that situation is exactly what we want to see May master--so why not now when it doesn't matter. Same with last night--get a really good look at Magill, and if that doesn't work, see what Rogers can do in a tight situation. I like it. The home run was awesome. I wasn’t expecting a home run but I was expecting Joe to come through. He is the Twin I want up in that situation. In a lost season like this one, these sorts of feel-good moments (Mauer's pinch-hit homer in particular) seem all the more sweeter. A fun game indeed. Please refrain from characterizing posters and making this about them. This is a game recap. Make your posts about that. Yup. Even if against the Tigers, it's fun to see a win in this manner. And it was the first pinch-hit home run by the Twins all season. Molitor mentioned how he wanted to get Magill some looks in late-inning situations. Why tonight was the time to give him a shot to close, I'm not sure. On Rogers, he seems to be Molly's go-to guy in a jam. Rogers has only allowed nine of his 32 inherited runners to score (28.1%) while, just for comparison's sake, 14 of 23 have scored on Hildenberger (60.9%). I'm happy to see different guys getting opportunities in different spots. I don't think they should lock anybody in as the closer or only reserve certain guys for blowouts like Molitor has done so often in the past. Being flexible and using guys to their strengths is the best way to really get the most out of your entire bullpen, in my opinion. One of the reason for signing free agents is to be able to flip them for prospects in July.Not something we did much of prior to this year, but they did a great job in the last month with Lynn, Duke and Rodney. The first pinch-hit homer by the Twins all year?! Yikes! Now I'm depressed all over again. Ooops ... sorry ... at least that's what I thought I heard the broadcasters say. I'd be more than happy to be wrong on that. There are still three AL teams who don't have a pinch-hit homer, including the Yankees. The AL average is one and the White Sox are the only team with more than two. And it was the first pinch-hit home run by the Twins all season. This is correct. The only remaining MLB teams without a PH HR in 2018 are Detroit, the Yankees, and Seattle. Not to jinx the Twins, but Detroit and Seattle haven't hit one since 2016. I caught bits and pieces of the game. I saw the 7th and witnessed Austin's blast--wow, dude has big-league power! 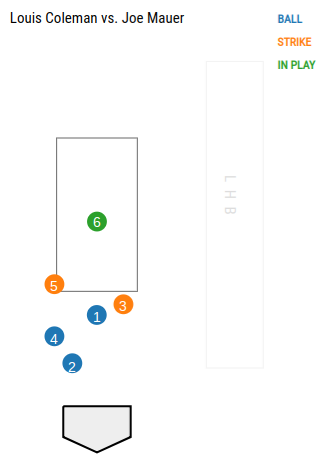 I fully expected Mauer to walk in that situation, but when the reliever grooved the 3-2 pitch I was pleasantly surprised. Beautiful swing, great result=stolen victory. As far as the bullpen, I'm liking what I see from Moya and I will start a thread on Rogers in a few minutes. I don't see a closer from what is there now, although it could possibly be (Trevor) May next year. Maybe Reed recovers and is the guy, but right now there isn't a sure thing. I saw too much of Hildenberger giving up runs in the last few weeks to be comfortable with him finishing games. There are options and there is money to sign someone. I really don't think this pitching staff is far away from being more than okay. Mauer has come to the plate 78 times with RISP this year and walked only 13 times.That's, what, a hair less than 17% of the time? And two of those walks were intentional.So really, more like 14% of the time. But I am happy for him and the team he hit the HR.